The typing notification could be worse. Remember that collective document editing thing Google did for a while where you saw every keystroke other users made? They were talking about using that technology as a messaging app: you could see what people were typing as a reply as they typed it. Off and on, I check in with my facebook or quora account to see if any friends or acquaintances have said anything interesting, fun, or even relevant to me. When I decide it's time to move on, and try to close the window, it often tells me that I have an incomplete reply, and do I want to delete it? Invariably, I don't remember starting any reply (that I haven't immediately sent), so I scan backward to try to spot it. Usually I can't. I'm guessing that I accidentally brushed against some key (or the touchpad) and that got interpreted as a request to reply to something, but It's hard to verify that. There seem to be no tools to say "Show me my incomplete input widgets", or if there are, I can't find any clues for finding them. It seems likely that lots of people have one of those "..." someone-is-typing-a-reply thingies on their screen, and as long as I leave my window open, they'll never see a reply. This strikes me as a somewhat user-hostile part of such user interfaces, but what can I do about it? SunAvatar wrote: but I'm glad there aren't 'has opened a blank note to compose a reply to you' notifications. This is assuming I've even opened the app to trigger the 'seen' notification. jc wrote: Off and on, I check in with my facebook or quora account to see if any friends or acquaintances have said anything interesting, fun, or even relevant to me. When I decide it's time to move on, and try to close the window, it often tells me that I have an incomplete reply, and do I want to delete it? Invariably, I don't remember starting any reply (that I haven't immediately sent), so I scan backward to try to spot it. Usually I can't. I'm guessing that I accidentally brushed against some key (or the touchpad) and that got interpreted as a request to reply to something, but It's hard to verify that. What happens in FaceBook is: us software-savvy folk terminate a comment with a carriage return (aka "Enter" key). FaceBook helpfully responds by placing focus into a new "comment" field, which of course we didn't want and didn't notice. But because the cursor is there, FB thinks you didn't finish the comment. Hit <ESC> now and then to fix this. Draco18s wrote: The typing notification could be worse. Amazing: who would have guessed that there's a practice that works well in both Facebook and vi?! I'm glad there aren't 'has opened a blank note to compose a reply to you' notifications. Pidgin has a "psychic" mode that does exactly this (see https://www.howtogeek.com/102919/5-tips-and-tricks-for-pidgin-users/). 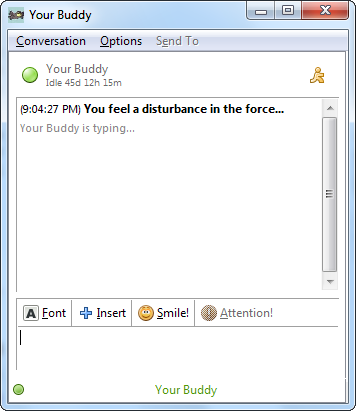 It actually opens the chat window, so if you are quick you can send a message before the other person. Naturally this depends on the underlying protocol, but I remember it working for MSN messenger. You can still do that. It's a terrifying thought, though, to have that on a messenger. *shudders* We'd have to train ourselves to pre-censor stuff the way we do when we're talking. Many friendships would die in the process. Draco18s wrote: Remember that collective document editing thing Google did for a while where you saw every keystroke other users made? They were talking about using that technology as a messaging app: you could see what people were typing as a reply as they typed it. There's more. You know these "chat online with our support" systems? It's a standard feature there! (At least I guess so, I worked with two such CRM/support platforms and both had it.) Always makes me nervous when I'm using these forms. I've had colleagues who were like that on Skype/Slack/whatever for regular work discussions. After five minutes of watching ellipses appear and disappear you'd be like COME ON MAN, SPIT IT OUT!! And then finally you'd receive about eight finely crafted words comprising a highly condensed summary of carefully considered thoughts. Which mean absolutely nothing to you since you didn't get to follow the thought process. Devil N wrote: And then finally you'd receive about eight finely crafted words comprising a highly condensed summary of carefully considered thoughts. Which mean absolutely nothing to you since you didn't get to follow the thought process. Guilty. I did say all I wanted to. This comic messes with my eyes, I keep seeing gray dots appear by the internal corners of the frames. Anyone else get that effect? "Have you seen an optician?" Sounds like Grid Illusion. And yes, I see it also. Those who are old enough (and worked in the right places) will know that the old, old, old Unix talk(1) app worked that way. This often led to folks whose typing speed or accuracy was slightly below the company average becoming targets of teasing and mockery in the break room. Can't say I miss it, even though I wasn't a target.